Some of nation’s fastest swimmers continued to roll through the meet by putting together impressive preliminary swims on day two of the 2018 NCAA Division II championships. Nova Southeastern University’s IM all-star Courtney Deveny produced one of those impressive swims by earning the lane four position in tonight’s 400 IM A final, with a time nearly three seconds faster than anyone else in the morning preliminaries. Deveny, who cruised a 4:19.54 in the heats, will look to build off her sixth place finish in last night’s 200 IM final with a win for the Sharks tonight. If Deveny does earn a victory tonight, it will mark the second individual NCAA title for the lady Shark, as she won the 400 IM her freshman season. This morning’s session got underway with Queens posting the top time in 1:31.24 ahead of Drury who swam a 1:31.96 while Nova was in the third spot with a 1:32.74. Rounding our tonight’s A final will be Saint Leo in a 1:33.14. Oklahoma Baptist swam away with the top time going into tonight’s A final with a 1:17.92. Queen’s squad touched in 1:19.07 while Delta State was in the third position in a 1:20.37. Nova’s Florida grown go-to girl, Courtney Deveny handily took the top seed going into tonight’s A final with her 4:19.54 which was well off her entry time of 4:16.40. This shows that Deveny should have much more in the tank tonight. Taking second was Bavindeep Basra (4:22.29) out of Fresno Pacific while Cal Baptist’s Sofia Petrenko (4:22.52) followed behind in third. Rounding out the A final tonight will be Fresno’s Laura Fornshell with her 4:25.01. Leading the B final is Queens junior Hayley Blauuw with her time of 4:25.69 from this morning. 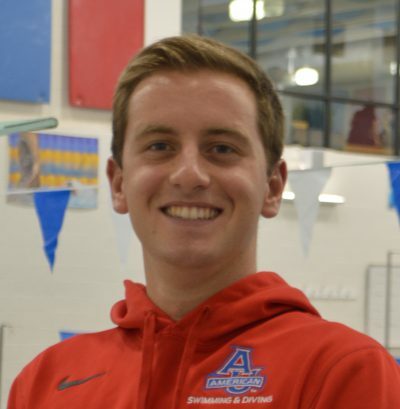 Simon Fraser’s Rolando Hernandez swam the quickest time of the morning with a 3:48.93 ahead of Florida Southern’s Matthew Holmes who took the second spot with his 3:49.12. Touching third was Truman State’s William Shanel in a 3:49.19. Taking lane eight tonight will be Drury’s Young Tae Seo (3:52.61). Queen’s Georgia DaCruz earned the lane four spot in tonight’s A final with a 53.49 ahead of Delta State’s Lucia Martelli (53.75). Simon Fraser’s Jessie Gibson and Drury’s Bailee Nunn each swam a 53.88 to tie for third. Rounding out the A final will be Fresno’s Daria Belova in a time of 54.42. Queens senior Paul Pijulet took the top seed with a time of 46.45 which was good enough to get ahead of Drury’s Pavel Semochkin (47.21) and Delta State’s Giulio Grugnoni (47.36). Earning the lane eight spot tonight by virtue of his 47.75 was Fresno Pacific’s Aleksei Averchenko. Margaret Stansberry earned Carson-Newman a lane four spot with her 1:47.10 ahead of Lindenwood’s go-to freestyler Simone de Rijcke who swam a 1:48.37 for second. In third was Queens senior Mckenzie Stevens in a 1:48.49. Taking eighth was Lindenwood’s Morgan Fischer in 1:49.39. 200 IM DII National record holder and last night’s champion, Queens junior Marius Kusch touched well ahead of anyone else in a time of 1:35.08 while Indy’s Guilherme Zavaneli took second in 1:36.24 with Truman State’s Samuel Heveroh in a time of 1:36.48. Touching in eighth was McKendree freshman Alexander Skinner (1:37.39). The Queen’s prelim quartet swam a time of 3:40.34 ahead of Fresno Pacific’s team, who produced a 3:42.28 for second. Taking the third spot heading into tonight’s session was UCSD in a time of 3:43.34. Rounding out tonight’s A final will be CSU East Bay with their 3:44.82. The Queens University men followed up on the women’s momentum by throwing down a 3:10.72, which earned them the top seed going into tonight’s A final. Wingate’s group of four touched second in 3:12.50 while Wayne State’s squad is sitting third in 3:13.53. Rounding out the A final will be UCSD’s team who put together a 3:15.16 this morning. Preliminary action for the 1-meter diving event will begin at 2 p.m. EST.